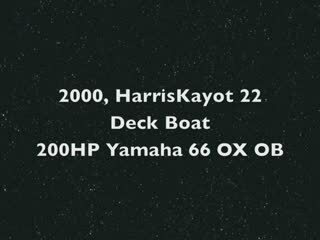 This 2000, 22' Harris Kayot 226 SuperDek is simply set up for fun on the water! The unique layout offers plenty of room to bring along lots of friends and family to come along. She has a privacy head, ample storage throughout the entire boat, easy side or aft boarding, wet bar and cooler storage compartment. Best of all IRON ORE is powered by a YAMAHA 200HP OX66 Fuel Injected Salt Water Series II Outboard Motor, delivering an extremely low draft along with ample dependable power! At the helm, you will find the Yamaha Speed Indicator, Yamaha Tack Indicator, Realistic VHF Marine Radio, Lowarance Depth Gauge w/Alarm, Hydraulic Steering and Bucket Captains Chair. Also included is a full tonneau cover for the boat to help keep her clean when she's not being used. The deck table conveniently stows away below the seat keeping it out of the way freeing up even more deck space. 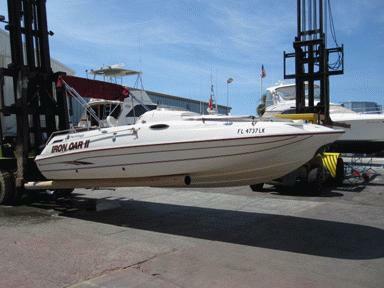 This boat is stored high and dry at an inside storage facility and is very easy to show. Don't miss out on this one! Call today for a personal walk-through on IRON ORE, you will be glad that you did! BROKER'S COMMENTS: Showings by appointment only. Call: Jerry Chiappetta, Jr @ 239-430-BOAT(2628).